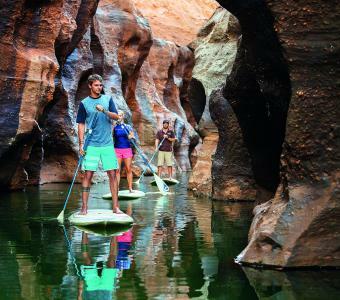 There's no better way to grasp the uniqueness of the narrow gorge with its majestic, 30-feet sheer walls than to get up-close-and-personal with it. 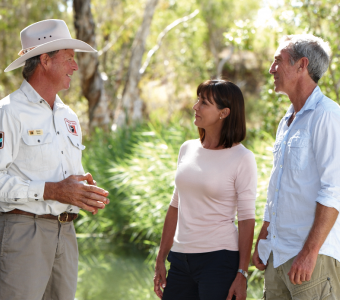 It will be an unforgettable highlight of your trip to outback Queensland, Cape York or Savannah Way. 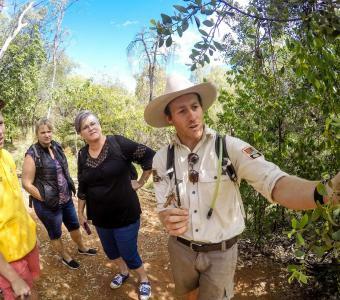 This 3 hour tour begins with an informative insight to the geology of the rugged sandstone formations with a guided bushwalk to the top of the escarpment. It's a relatively easy walk with the reward of a magnificent view of the gorge below. Then glide on custom-made, electric powered boats in almost eerie silence ensuring minimal disturbance to wildlife. There's every chance of seeing one of the large population of resident freshwater crocodiles. Camera with plenty of available memory - you'll need it! 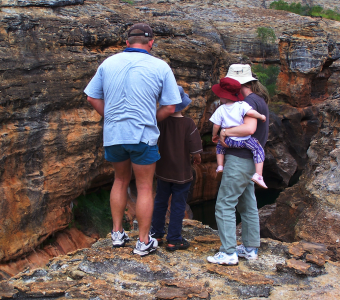 Access to Cobbold Gorge is by guided tour only. No pets allowed on tours. FAMILY RATE includes two (2) adults and up to four (4) children aged between 5-15 yrs. 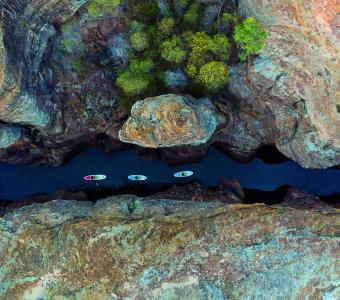 There's no better way to grasp the uniqueness of the narrow gorge with its majestic, 30-feet sheer walls than to get up-close-and-personal with it. 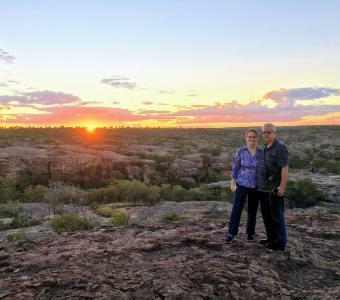 It will be an unforgettable highlight of your trip to outback Queensland, Cape York or Savannah Way. 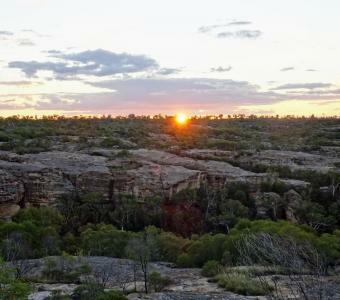 This 3 hour tour begins with an informative insight to the geology of the rugged sandstone formations with a guided bushwalk to the top of the escarpment. It's a relatively easy walk with the reward of a magnificent view of the gorge below. Then glide on custom-made, electric powered boats in almost eerie silence ensuring minimal disturbance to wildlife. There's every chance of seeing one of the large population of resident freshwater crocodiles. For those short of time who cannot stay overnight. 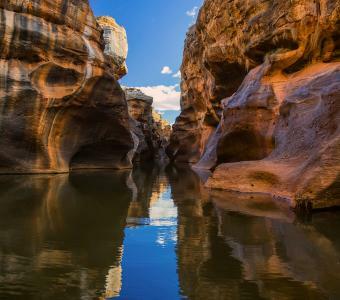 There's no better way to grasp the uniqueness of the narrow gorge with its majestic, 30-feet sheer walls than to get up-close-and-personal with it. Tours depart 10am April-September and 8am in October from reception at Cobbold Village. Please arrive 15 minutes before tour time, park in Day Visitor Parking area, walk down to reception and advise that you have arrived. Please note, we do not have animal minding facilities, if you travel with pets they must remain in/at your vehicle whilst on tour. Access to Cobbold Gorge is by guided tour only. Bookings essential. Tours depart 10am April to September and 8am October from reception at Cobbold Village. Please arrive 15 minutes before tour time, park in Day Visitor Parking area, walk down to reception and advise that you have arrived. Please note, we do not have animal minding facilities, if you travel with pets they must remain in/at your vehicle whilst on tour. Available daily 1.30pm 1 June - 31 August and peak times. There's no better way to grasp the uniqueness of the narrow gorge with its majestic, 30-metre sheer walls than to get up-close-and-personal with it. 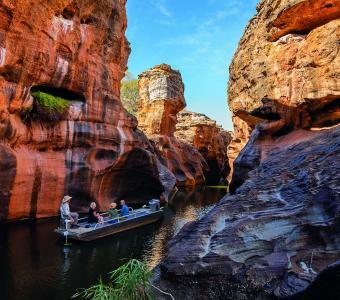 This three hour tour including a walk to the grave of pioneer John Corbett and a boat cruise and tour of the gorge will be an unforgettable highlight of your trip to outback Queensland, Cape York or Savannah Way. 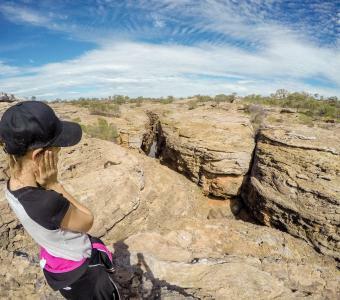 This 3 hour tour begins with an informative insight to the geology of the rugged sandstone formations, followed by a guided bushwalk to the top of the escarpment. It's a relatively easy walk with the reward of a magnificent view of the gorge below. No pets allowed on tours. If you have pets selected in your site booking, please remove all pets to see available tours. Tours depart 10am everyday from reception at Cobbold Village. Please arrive 15 minutes before tour time, park in Day Visitor Parking area, walk down to reception and advise that you have arrived. Please note, we do not have animal minding facilities, if you travel with pets they must remain in your vehicle whilst on tour. If you have always wanted to try SUP then there is no better place to give it a go - No Waves and No Wind, a perfect place to begin. 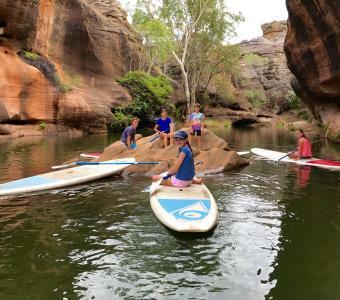 Experience a breathtaking adventure of Paddle Boarding whilst silently gliding through the narrows of Cobbold Gorge. 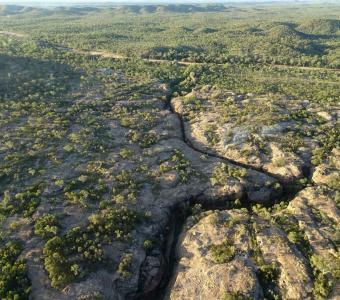 A one hour guided tour of the gorge allows you to take in the wonders of this geological master piece of ancient landscapes. Suitable for all abilities and fitness levels. Participants must be at least 13 years +. Children prices apply to 13-15 years inclusive. 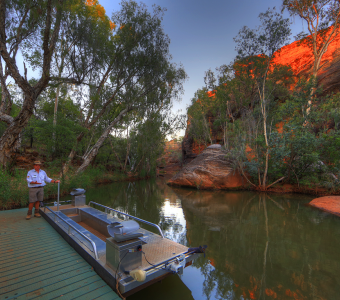 Please be aware if booking in cooler months the water in Cobbold Gorge is quite chilly especially if you fall in! Bring: Towel, footwear and water bottle. 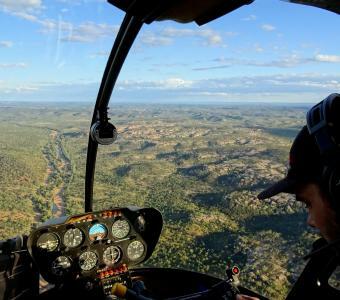 Helicopter flight offer visitors the ultimate flexibility in exploring and discovering the features of Cobbold Gorge which are not accessible to the public any other way. 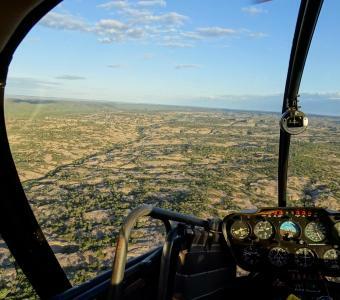 A scenic helicopter flight is a thrilling and unforgettable experience. 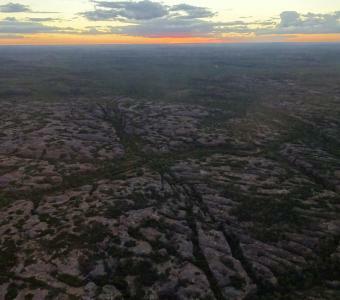 There is simply no better way than from the air to appreciate the vastness and beauty of the Gulf Savannah region. 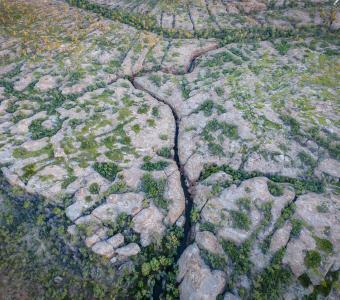 15 minute scenic flight - for breathtaking views over Cobbold Gorge and localised area. 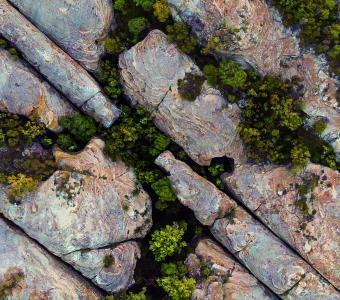 30 minute scenic flight - extended tour option over Cobbold Gorge, Kimberley Sue Lake, Robertson Gorge, Sandstone Sculptures and Robin Hood Station. 60 minute Sunset Heli-picnic flight - there is only one per day so book in early for this amazing theatrical colour display over the sandstone. 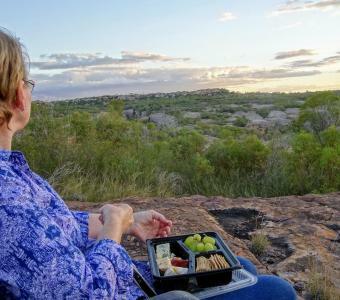 Or create your own: Go gem fossicking at Agate Creek, explore the many hidden gorges or chasms or spirit away for a romantic picnic for two in the most stunning surrounds imaginable. Options for helicopter flights are limited only by your imagination and budget - you come up with the idea or destination and we'll negotiate a price! Flight times will be arranged on arrival. Minimum 2 passengers, maximum 3 passengers per flight. N.B. Flight times will be arranged on arrival.